Carin, who is a multiple winner on the LET and LPGA tours, will work closely with Syngenta in its ongoing support of golf clubs and courses, and its industry-wide initiatives aimed at 'Unlocking Golf's True Potential'. Carin Koch said: "I've been impressed with Syngenta's commitment to help golf clubs and courses gain a better understanding of what current players and prospective customers want. "I attended the recent launch in London of Syngenta's golf market research report into female participation, which not only shows what a significant opportunity there is for the industry, but how courses can take simple, practical steps to make their venue more female and family friendly. "I have two children and we play golf as a family. The solutions in the report and the approach Syngenta is taking, concur with my own thinking and I wanted to lend my support to a cause I wholeheartedly believe in." 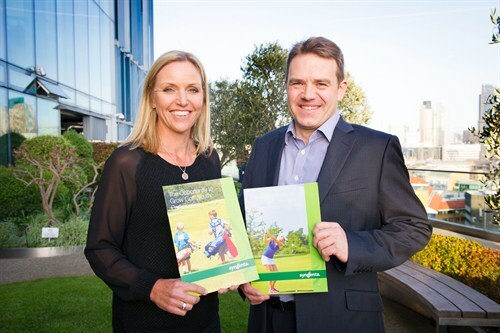 Syngenta Golf Ambassador and Solheim Cup Captain, Carin Koch, with Syngenta Head of Turf & Landscape, Simon Elsworth, at the launch of the company's Female Participation report. Simon Elsworth, Syngenta Head of Turf & Landscape EAME, who recently hosted Carin on a tour of Syngenta's turf grass research and development facility in Stein, Switzerland, said she would play an important role in Syngenta's activities. "Carin has a genuine, deeply-held desire to see more women and girls playing golf, which resonates with the opportunities highlighted by our market research. "She speaks with passion on issues relating to participation and is a great ambassador for golf. Carin will be joining Syngenta when we present and discuss the results of our female participation report at GolfBIC 2015, March 16-17, at the Marriott Forest of Arden, and will be an active member of our team by contributing to initiatives and representing the brand." A report on The Opportunity to Grow Golf: Female Participation was published in December and can be downloaded free of charge here. A video of the Female Particpaition report launch event, as well as a series of mini-documentary videos showcasing the work of UK golf clubs successfully recruiting women and young people to golf, is also available in the GreenCast Growing Golf section.